Are you a serious (or semi-serious) bowler interested in some tips to improve your game? If so, you have come to the right place. While some of the most advanced and proficient bowlers may not be anxious to share their successful secrets and thus ruin their advantage on the lanes, here we have unearthed some of these secrets and transformed them into some easy-to-follow tips that will rapidly help you improve your game. If you are reading this article on “How to Get Better at Bowling,” we have to assume you are at least familiar with the rules and basics of the game. As such, we will dispense with the ABCs and get right to the good stuff. Here are just a few advanced bowling tips that, when followed, will help you surprise your friends on your next big bowling outing. If you go to a bowling alley at which you are not familiar with the lanes, your opponent may have a distinct advantage if this is his “home alley.” Perhaps some or all of the lanes are very dry—or at least dryer than that to which you are accustomed. Because of this, you find that your ball is taking the break a bit too early and causing you to miss towards the far left or Brooklyn side of the rack. If this is the case, you will need to speed up your ball. This does not necessarily mean that you have to throw the ball harder, but you will need to hold the ball about three to four inches higher than usual in your stance. By doing this, you are creating a higher release point, and allowing gravity to do all the work. Some bowling alleys may boast lanes that are excessively oily. This oil can have the tendency to prolong the straight portion of your normal shot, causing the shot to break too late. To allow the ball to break as intended, you will need to slow the ball speed, giving it ample time to make the break towards the pocket. So how do you slow down a bowling ball without changing your natural rhythm? If you guessed lowering it in your stance you receive a Gold Star. Just like raising the bowling ball in your stance will speed up the pace of the bowling ball, so too will lowering the bowling ball slow its pace. Again, it is all a matter of allowing gravity to do its job. You know the feeling. It’s the tenth frame and your team needs you to bowl a strike to beat the opponent. With sweat dripping from your brow, you shakily take your stance, thinking about all the bad that can possibly happen. Then, with everything on the line, you release the ball high and hard, just to watch it hook into the gutter. If this sounds like you, fret not. It happens to a lot of bowlers. Bowling can be a high stress game at times, and unless you learn to handle the stress of the big shots, failures like the one described above will continue to happen. So how do you mitigate the stress that comes with big shots? You practice them. This may sound like a very simplistic answer to a serious problem, but the right type of practice can help you make stress a thing of the past. First, you must practice these types of shots as if the season was on the line. Then, once you begin to successfully make that shot more than you miss it, try to identify just two parts of your approach that are leading to that success—one in the beginning of the approach, say your stance, and one at the end of your approach, maybe your release point. The reason for doing this is very simple: if you are concentrating on your perfect stance and release point, there is no time to concentrate on the stress surrounding your shot. By focusing on the positive rather than the negative, you are able to just bowl—and NOT think—and your muscle memory, from all the practice you have been doing, will simply take over. Professional bowlers have mastered the art of the strike—the highest-scoring shot in bowling. After all, had they not mastered the strike they probably would not be considered professional. However, for the rest of us, we are much more likely to encounter spare opportunities—opportunities to pick up “all” of the other pins that we missed on our first shot with our next—and last—shot. That’s right; you only get one opportunity at a spare so it pays to become proficient at making these shots. “A player achieving a spare is awarded ten points (for knocking down all ten pins), plus a bonus of whatever is scored with the next ball (only the first ball is counted).” So, if you miss your one-pin spare, you will be awarded 9 points, representing the 9 pins you knocked down. However, if you make that spare, and then bowl another 9 with your next shot, the score for the spared frame now becomes 19—10 for the original pins and another bonus 9 points for the first 9 balls of the next frame. And these bonus points can quickly add up to a good score. One-pin spare opportunities typically happen when the ball at the top of the triangle (the 1-pin) is hit head-on. But regardless of how these one-pin spare opportunities happen, they can be very tricky to pick up. Here are just a few tips for picking up various types of one-pin spares, and for this tutorial we are assuming you are a right-handed player. Pins to the left of center. If the solitary pin is located to the left of center, you can typically employ your normal right-to-left hook to pick up the spare. You may have to adjust your stance closer to the center, or adjust the speed of the ball by raising it or lowering it. Pins in the center. If the solo pin to be picked up is situated in the middle of the lane (either the 1-pin or 5-pin), you have two options. Some choose to employ their regular hook and regular stance, aiming for the center of the lane instead of the pocket. Others may throw a straight shot down the middle of the lane to increase their chances. If you choose the latter option, we recommend selecting a slightly heavier ball, as these tend to roll straighter than the lighter balls, which are usually used for hook shots. Pins to the right of center. If the single pin spare is located to the right side of the alley, and if you are a right-handed player, we strongly recommend a straight shot with a heavier ball. Trying a hook shot from this position can be very risky and may cause you to lose your ball in the gutter. A good bowler is a polite bowler, and there are several unwritten rules that every player should follow. By extending these courtesies you will not only be playing the game the right way, you can also expect the same courtesies to be likewise extended to you. This ultimately creates the fun, fair and polite atmosphere that makes bowling so special. If a bowler to the right or left of you is taking his or her stance or approaching their lane, please allow them to fully complete their shot before you approach your lane. Bowling is a game of concentration, and should you march up to your lane while the other person is shooting, the sight of you from their periphery can cause them to lose their concentration, which almost always ends up in a poor shot. 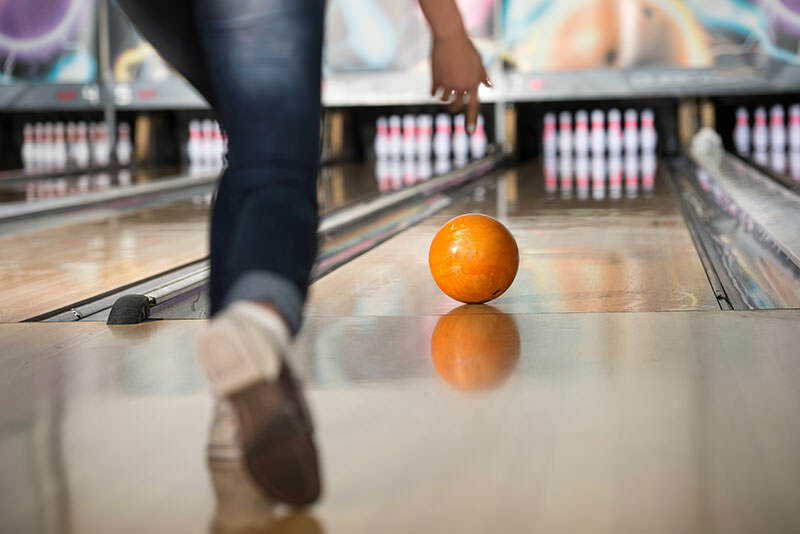 Whether you have your own pair of bowling shoes or you need to rent a pair from the bowling alley, you should never step foot on the lanes without wearing them. Street shoes can damage bowling lane surfaces and subsequently ruin the game for everyone participating on that lane. After you have completed your shot, do not stand at the head of the lane and celebrate longer than you need to, as other people on other lanes may be waiting to take their shot. There will be plenty of time to celebrate a good shot once you return to the seating area. So be courteous after your shots have been completed. Finally, talking to other bowlers as they prepare to make their shot is very taboo and should thus always be avoided. In fact, try to keep the noise level to a minimum at all times as to not impact the concentration of the bowlers in your immediate vicinity.